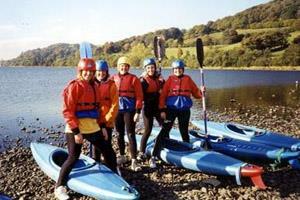 Improvised Rafting at Mountain and WaterRaftingIdeal for a team-building event, youth group or adventurous family. Families and small groups may build a single raft, larger groups can opt to build several rafts and race them. Build and paddle your own raft. You will be given a selection of materials to build you raft, which you can put to the test by paddling a short distance (and back). March to October by arrangement.